For those of you in the Dallas area or in Texas period, let me tell you about a little gluten-free gem that’s happening next month. 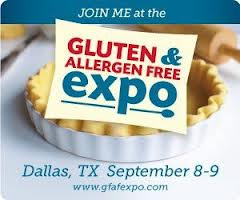 It’s called the Gluten & Allergen Free Expo and this is the second year that our support group, GIG of Greater Dallas, is hosting it. It was started by Jen Cafferty, a gluten-free chef out of Chicago, and Dallas was her first stop outside of the windy city. We had over 2,000 people and over 70 vendors last year, and this year we are anticipating double the attendance with over 100 vendors! Woohoo! Mark your calendars for September 8 & 9, 2012 and get ready to sample gluten and allergen free products out the wazoo! It will be crazy with all the free samples, authors, services, and raffle products that will be going on this year. Tickets are $20 for the vendor fair and you can get them in advance by going here. Jen is also offering early-admission tickets for those that want to meet and greet the vendors an hour earlier-before the mad rush ensues. Do you want to learn how to cook and bake on a restricted diet? Attend our demonstration cooking/baking classes. The classes are taught by top chefs, nutritionists and cookbook authors in a friendly environment. You will watch how to prepare all of the recipes and have time to ask questions of the presenters. The cooking classes are free-of-charge with the purchase of your vendor fair ticket. Each class has a maximum capacity of 100 people. The classes are first-come first-served and seating is limited. At the end of each class, we will ask that the room be vacated and a new set of attendees can enter to see the next presenter. Are you looking for lifestyle tips and tricks while on a restricted diet? Attend a class on our Lifestyle Stage. The classes are taught by experts in their field. Classes range from how to save money, kids birthday parties, health issues, etc.. The lifestyle classes are free-of-charge with the purchase of your vendor fair ticket. Each class has a maximum capacity of 100 people. The classes are first-come first-served and seating is limited. At the end of each class, we will ask that the room be vacated and a new set of attendees can enter to see the next presenter. Do you want to try new products but aren’t interested in cooking classes? Come to the vendor fair! The vendor fair is open to the public with a special area dedicated to nut/tree nut allergens. The fair features over 100 vendors both sampling and selling their products. There are also cooking and lifestyle stages with topics pertaining to gluten and allergen-free living throughout the day. The stages are included with your vendor fair ticket. Tickets are available at the door or online. Purchasing your ticket online will allow you to gain entry without waiting in the payment line. The best gluten & allergen-free deal in town! What do you get for the price of admission to the vendor fair? This Expo if off the chain with all the contacts you can make and yummy goodies to sample in your belly; so get here by bus, train, or plane if you can! Also, a new event this year will be the Gluten Free 101 classes taught by our group’s own Betty Murray, C.N., H.C.C and Cheryl Gainer, MSN, RN, CNM on Saturday and Sunday. These two ladies are a wealth of knowledge and I could listen to them both for hours! So check it out if you get a chance and let me know if you are planning to go. You know I’ll be there bright eyed and bushy rat tailed all weekend long, volunteering and trying to stay away from those darned non-paleo goodies! Luckily my parents and sis will be in town so they can help wrangle Emma and keep her toddler paws off all those free samples. Psst-Won’t be able to make it to the Dallas Expo? Don’t worry… The GFAF Expo will be heading to San Francisco on February 9-10, 2013 and Chicago on April 20-21, 2013. Stay tuned for more information! Will the expo be coming to FL anytime soon? I’ll get a word in for ya and see if I can put a bug in the founder’s ear!